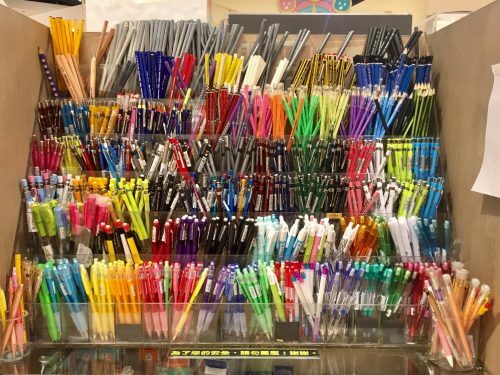 Taipei is a stationery lover’s paradise. No matter where you are, you won’t have to go far to get some shopping done in the city. Even in the most residential areas, you’ll find yourself walking by some form of school supply shop or stepping into a convenience store with a decent assortment of mechanical pencils, erasers, rulers, and pencil pouches. During my time in Taiwan, I was able to visit most of the stores recommended to me. My first stop was Kuangnan, a brightly lit two-floor store (the upper floor is where you can find stationery). 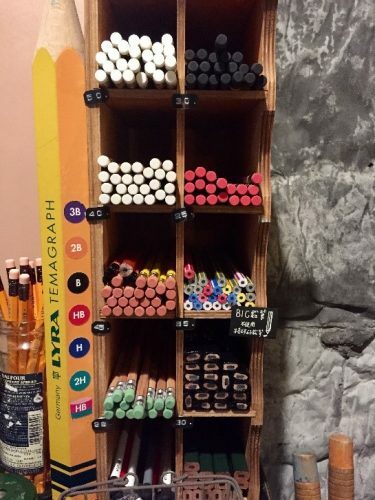 The stationery section of the store focused on pens, notebooks, and binders, but I did find a pencil section which featured a selection of labelled and unlabeled dime pencils. I also grabbed a cool pencil pouch for about 3 US dollars. The second store I visited was the large Eslite location near City Hall. Visiting Eslite was quite an experience. 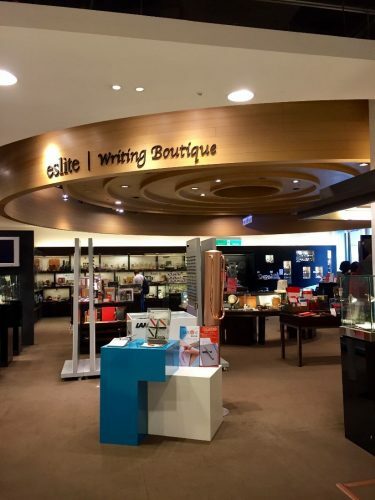 It felt like a glossy shopping mall with a strong literary bent. I found everything from a Powerpuff Girls café to an organic olive oil shop. In my mad rush to find some pencils, I first stumbled across the “Writing Center” (pictured below) which mostly carried fountain pens and fountain pen related ephemera. They had these gorgeous Caran D’ache pencils—a set of four for $30 USD, which I had to pass on, but a quick trip upstairs landed me with some well-priced single Caran D’ache pencils, a cool store brand notebook, and an Agatha Christie novel I hadn’t read yet. The store is a must for lovers of washi tape, as I felt like I couldn’t walk ten feet without bumping into another selection of (admittedly not cheap) beautifully designed tape. I also found this huge table of Rhodia products, half of which I hadn’t seen before. The store also carried Leuchturrm, Midori, and Moleskine products. The day I set out to hit the rest of my stops, it was pouring rain (yikes!) I’m pretty sure I ruined by shoes, but my love for stationery won out, and I found some real gems! I only stopped by the Pinmo Pure store for a few minutes, but it was a really cool little DIY notebook place. 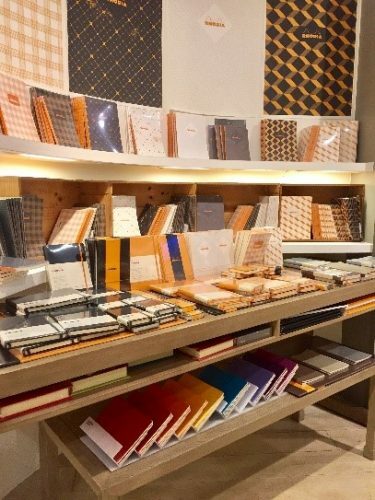 If I had more time, I could imagine spending hours there picking through the various grades of paper, stamps, covers, and binding options before coming out of the store with an awesome personalized notebook. 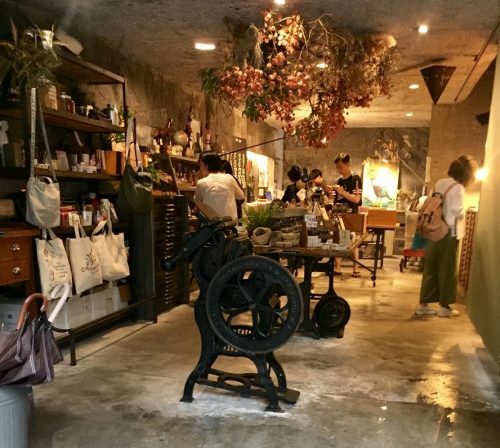 Like a lot of boutique stationery stores in Taipei, the store’s aesthetic very trendy and the employees seemed friendly. 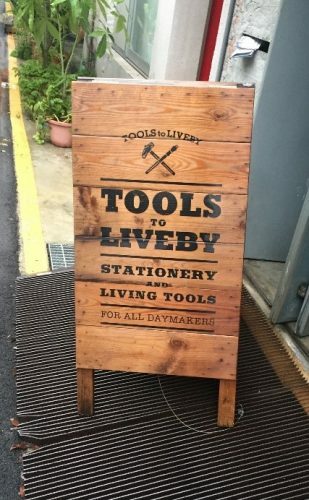 Tools to Live By was the kind of stationery store you wish you had down the street from your apartment. 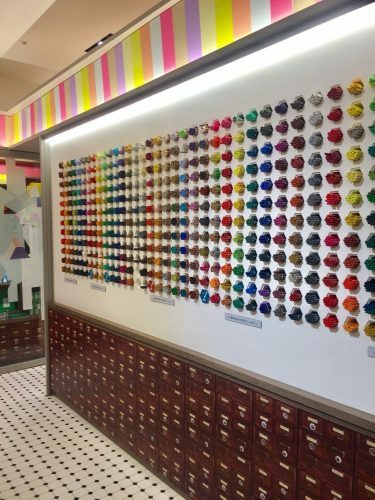 It’s meticulously kept and curated and carries a strong assortment of pretty much anything you’d ever want. It was also the store I visited which carried the most American made pencils and notebooks. 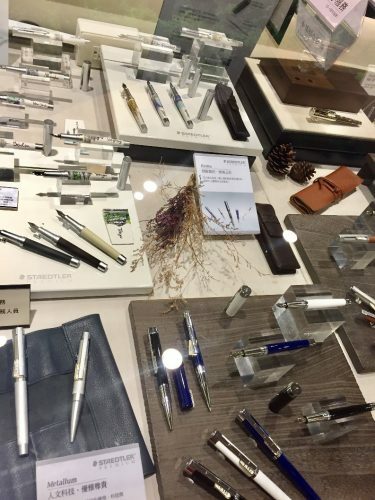 They also had a nice selection of fountain pens and ink. They had a myriad of Japanese pencils as well as American pencils including loose Field Notes pencils (both the round ones and carpenter), Rhodia pencils, Palomino HBs, and a couple of loose Guy Clark editions too (which I happily picked up). They had some individually wrapped (!) Pitch Black Field Notes. They also had a really amazing selection of high quality (and priced) “Tools to Live By” branded items from delicate and surprisingly heavy scissors to beautifully thin metal rulers. CONCLUSIONS! 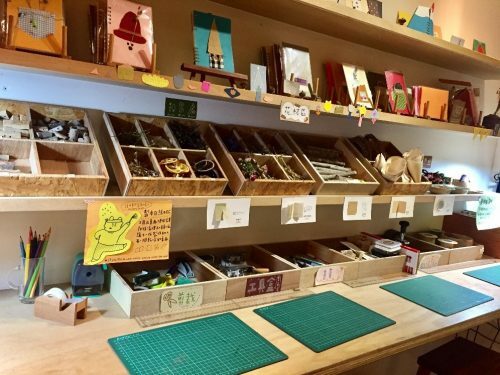 Taipei is a really great place to check out if you’re a fan of stationery. The city is wonderful (lots of tree covered mountains in the distance), with a very clean and easy to use subway system. 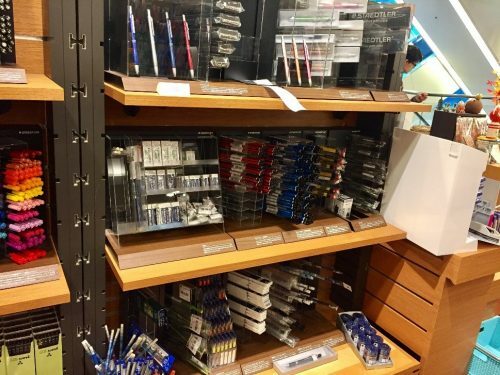 High quality stationery including Faber Castell and Staedtler as well as (surprisingly) Wopex pencils can be found pretty much in any stationery store as well as Taiwanese brands like Liberty and Rabbit. 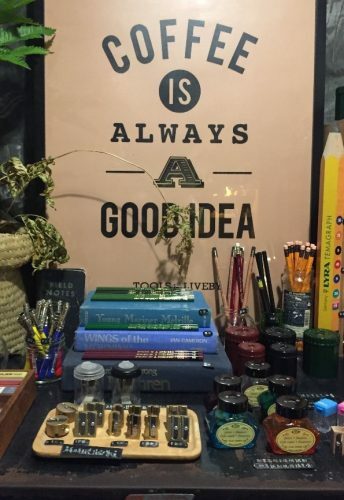 If you’re not picky about brands, you’ll be able to find plenty of pencils and cute notebooks of varying size and quality for fifty cents to a couple of dollars. that shivers as warm winds pass through. This entry was posted in Inspiration, Journaling, Travel and tagged travel on 20171114 by leslie. I decided to write a little bit on here about some of my school/study aides. Typically, I’m a pencil and paper type of woman, but sometimes I need technology. Being in graduate school means that I often have to write lengthy papers in APA 6th edition format. Carting around a heavy laptop is just not something I want to do, so I’ve found a way around doing so. The first, and perhaps, most important part of my carry for school was to buy a quality backpack that can carry everything I need safely. For this purpose I bought a Tom Bihn Brain bag with a Brain cell insert. 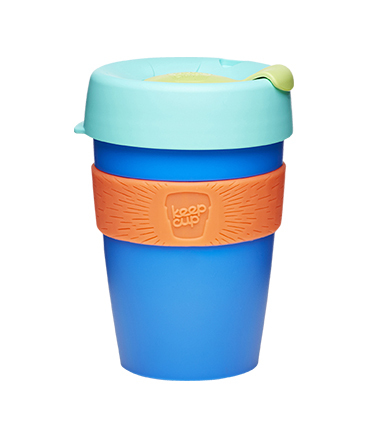 The bag is big enough to carry books, notebooks, tablet, and sundry items. It does the job well and is comfortable. Rather than carry a laptop I have decided to use a tablet for my computing needs. Most of the time the tablet alone is suitable for reading PDF articles, but sometimes being able to edit or write papers on the go is a necessity. The on screen keyboard is crap for typing for anything other than short bursts. Getting a bluetooth keyboard has been a necessity. Originally I bought the AmazonBasics android keyboard and I loved it but I put it into a crappy case and tossed it around in my bag without enough protection and broke it. I bought a replacement and it works well enough, but it’s much louder. I plan on replacing it with another AmazonBasics when school starts up again, this time with a nice case. Using the tablet as a word processor involves setting up Google Drive with blank documents and saving them to the tablet so I can work on them without wifi. The is important since many areas where I might want to work on my papers don’t always have the best or speediest wifi, like the commuter rail. Sometimes I get a seat near the wifi and it’s speedy and works other times I’m on a car that has terrible wifi. Or the coffee shop wifi is too slow to allow updates. Anyway, being able to work offline is a huge thing when I’m on the go. If you want to figure out how to make your google docs available on your tablet when offline go read here. I make all my reading notes longhand in a cheap composition notebook. I favor the Staples brand because they are 50 cents at back to school sales and I can buy a bunch for low money. The paper is also acceptable for any of my preferred writing tools. Also, they are sturdy enough that I can cart them around for a full semester and not have them too beaten up. With 200 pages I can take copious notes on my readings, classes, and jot down the first outlines for my papers. (How I generate my papers is another post for the future.) Additionally I can cut pages out if I need to do so. I also carry a small pocket sized planner. I’ve been using a Bandit Apple Carnet PeeWee size but I’m transitioning over to the Field Notes Ambition planner in February. Being able to transfer over in February is the great boon of using an undated planner. Current I carry both in a leather cover by Davis Leatherworks. An additional way of keeping track of my life is another Field Notes in a leather cover along with a pocket. This acts as an idea/mind dump as well as a to do list and shopping list. Thus far it’s working very well. Though I have to work better on my journaling. Anyhow, all the above is what I use to not only keep track of my life, but to process and record all the stuff I’ve got going on for grad school. I’ve really needed to pare down and figure out how to use tools in a specific manner. This is, of course, a process and how I use tools changes over time, but for now this is it. This entry was posted in Uncategorized and tagged backpack, brain bag, brain cell, office, on the go, school, tablet, tom bihn, travel on 20150202 by leslie.